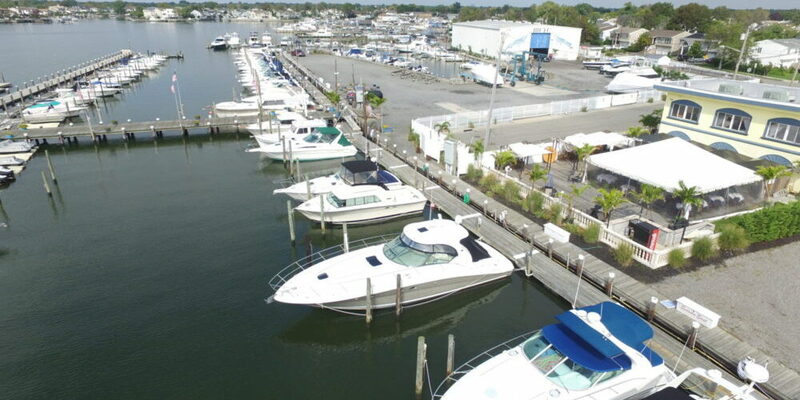 Marina – Blue Water Yacht Club, Inc.
BWYC is located on Merrick Bay mid-way between the Meadowbrook and Wantagh Parkways. The N.Y. State Boat Channel and Jones Inlet can be easily reached in about 20 minutes. New York City and Fire Island take about 1-1/2 hours of scenic cruising time and Montauk Point as well as Atlantic City are well within a days travel for the more adventuresome boater. FREEPORTS NAUTICAL MILE with its many fine restaurants and shops is only about a 15-minute boat ride. For the fisherman, the canals are full of the day’s catch and Hudson Canyon is just 75 miles away. With a total of 250 in-water slips, we can accommodate vessels up to 55 foot in length. Aluminum ramps provide easy access to the well lighted floating docks where water and electrical service is provided at each slip. Fingers are available on several slips for easier access to board. Should you prefer, our in-door DRYLAND storage building can accommodate boats to 27 foot in overall length. Our family center, with its pool, picnic areas, bathrooms, and showers are all newly updated and are for your personal use.